Yellow Emperor’s Canon of Internal Medicine is the most important theoretical text in the huge corpus of traditional Chinese medical literature, and is a must-read for any serious student of TCM. 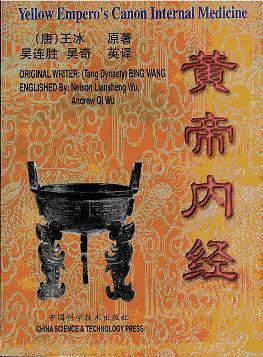 This edition by Dr. Andrew Qi Wu and his father Mr. Nelson Wu, is the world’s first translation from Chinese into English. It is an ambitiously executed effort and should be of great use to students and practitioners alike. The juxtaposition of Chinese and English text simplifies the task of readers who wish to verify or compare an English word selection with a Chinese character. This book won a gold medal of honor at the 4th Conference on World Traditional Medicine. Chinese Science and Technology Publishing House, 1999, ISBN: 7-5046-2231-1.